The melanocortin 1 receptor (MC1R), also known as melanocyte-stimulating hormone receptor (MSHR), melanin-activating peptide receptor, or melanotropin receptor, is a G protein–coupled receptor that binds to a class of pituitary peptide hormones known as the melanocortins, which include adrenocorticotropic hormone (ACTH) and the different forms of melanocyte-stimulating hormone (MSH). MC1R is one of the key proteins involved in regulating mammalian skin and hair color. It is located on the plasma membrane of specialized cells known as melanocytes, which produce the pigment melanin through the process of melanogenesis. It works by controlling the type of melanin being produced, and its activation causes the melanocyte to switch from generating the yellow or red phaeomelanin by default to the brown or black eumelanin in replacement. MC1R has also been reported to be involved in cancer (independent of skin coloration), developmental processes, and susceptibility to infections and pain. The MC1R protein lies within the cell membrane, and is signalled by melanocyte-stimulating hormone (MSH) released by the pituitary gland. When activated by one of the variants of MSH, typically α-MSH, MC1R initiates a complex signaling cascade that leads to the production of the brown or black pigment eumelanin. In contrast, the receptor can also be antagonized by agouti signalling peptide (ASIP), which reverts the cell back to producing the yellow or red phaeomelanin. The pulsatile nature of ASIP signalling through MC1R produces the characteristic yellow and black agouti banding pattern observed on most mammalian hair. In some species, ASIP signaling is not of a pulsative nature, but is limited to certain regions. This is especially conspicuous in horses, where a bay horse has black legs, mane, and tail, but a reddish body. A notable exception to this is human hair, which is neither banded nor particoloured, so is thought to be regulated by α-MSH signaling through MC1R exclusively. In the United States, about 25% of the population carries the mutated melanocortin 1 receptor that causes red hair. With one in four people as carriers, the chance of two people having a child with red hair is about 2% (one in 64). The prevalence of red hair varies considerably worldwide. People with freckles and no red hair have an 85% chance of carrying the MC1R gene that is connected to red hair. People with no freckles and no red hair have an 18% chance of carrying the MC1R gene linked to red hair. Eight genes have been identified in humans that control whether the MC1R gene is turned on and the person has red hair. In mutant yellow-orange mice and human redheads, both with nonfunctional MC1R, both genotypes display reduced sensitivity to noxious stimuli and increased analgesic responsiveness to morphine-metabolite analgesics. These observations suggest a role for mammalian MC1R outside the pigment cell, though the exact mechanism through which the protein can modulate pain sensation is not known. In a certain genetic background in mice it has been reported that animals lacking MC1R had increased tolerance to capsaicin acting through the TRPV1 receptor and decreased response to chemically induced inflammatory pain. Since G protein–coupled receptors are known to activate Signal transduction in cells, it should not be surprising to find MC1R involved in development. As one example at the cellular level, preventing signalling by MC1R stopped erythropoiesis from proceeding from the polychromatic cell stage (poly-E in the figure) to the orthochromatic cell stage (ortho-E in the diagram). The same report showed that neutralizing antibodies to MC1R prevented phosphorylation of STAT5 by erythropoietin, and that MC2R and MC5R were also involved, as shown in their model. One example at the tissue level showed the involvement of MC1R in the normal and pathological development of articular cartilage in the mouse knee. In this study the authors compared normal mice with mice completely lacking MC1R. Even without experimental induction of osteoarthritis, mice without MC1R had less articular cartilage (as shown by the red staining in the image). After experimental induction of osteoarthritis, the defect caused by MC1R was more pronounced. The involvement of MC1R in a rat model of Candida albicans vaginitis was investigated. These authors suggest that MC1R is important in anti-fungal and anti-inflammatory processes, in part because siRNA knockdown of MC1R almost completely prevented the responses. Nosocomial infections are of variable importance. One of the most important is complicated sepsis, which was defined as sepsis with organ dysfunction. One variant of MC1R (MC1RR163Q, rs885479) was reported to be associated with lowered risk of developing complicated sepsis during hospitalization after trauma. Thus, if the association is confirmed, MC1R targeting may become a therapeutic option to prevent severe sepsis. MC1R signalling stimulates antioxidant and DNA repair pathways, as reviewed. There are single nucleotide polymorphisms in MC1R that are associated with predisposition to nonmelanoma skin cancer. It has been reported that variants of MC1R, even in heterozygotes and independent of their effects on pigmentation, are risk factors for basal cell carcinoma and squamous cell carcinoma A review has discussed the role of some MC1R variants in melanoma and basal and squamous cell carcinomas independent of pigment production. Membranous glomerulonephritis is a serious human disease that can be treated with ACTH, which is a known agonist of MC1R. In a rat model of nephritis it was found that treatment with a different agonist of MC1R improved aspects of kidney morphology and reduced proteinuria, which may help explain the benefit of ACTH in humans. 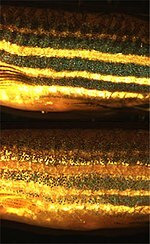 Zebrafish MC1R mediates the response of fish chromatophores on exposure to dark (top), in comparison to light (bottom), environments. MC1R has a slightly different function in cold-blooded animals such as fish, amphibians, and reptiles. Here, α-MSH activation of MC1R results in the dispersion of eumelanin-filled melanosomes throughout the interior of pigment cells (called melanophores). This gives the skin of the animal a darker hue and often occurs in response to changes in mood or environment. Such a physiological color change implicates MC1R as a key mediator of adaptive cryptic coloration. The role of ASIP's binding to MC1R in regulating this adaptation is unclear; however, in teleost fish at least, functional antagonism is provided by melanin-concentrating hormone. This signals through its receptor to aggregate the melanosomes toward a small area in the centre of the melanophore, resulting in the animal's having a lighter overall appearance. Cephalopods generate a similar, albeit more dramatic, pigmentary effect using muscles to rapidly stretch and relax their pigmented chromatophores. MC1R does not appear to play a role in the rapid and spectacular colour changes observed in these invertebrates. The Out-of-Africa model proposes that modern humans originated in Africa and migrated north to populate Europe and Asia. These migrants most likely had a functional MC1R variant and, accordingly, dark hair and skin as displayed by indigenous Africans today. As humans migrated north, the absence of high levels of solar radiation in northern Europe and Asia relaxed the selective pressure on active MC1R, allowing the gene to mutate into dysfunctional variants without reproductive penalty, then propagate by genetic drift. Studies show the MC1R Arg163Gln allele has a high frequency in East Asia and may be part of the evolution of light skin in East Asian populations. No evidence is known for positive selection of MC1R alleles in Europe and there is no evidence of an association between the emergence of dysfunctional variants of MC1R and the evolution of light skin in European populations. The lightening of skin color in Europeans and East Asians is an example of convergent evolution. ^ "The Red Hair Polymorphisms". Retrieved 20 July 2013. ^ a b Valverde P, Healy E, Jackson I, Rees JL, Thody AJ (November 1995). "Variants of the melanocyte-stimulating hormone receptor gene are associated with red hair and fair skin in humans". Nature Genetics. 11 (3): 328–30. doi:10.1038/ng1195-328. PMID 7581459. ^ Morgan MD, Pairo-Castineira E, Rawlik K, Canela-Xandri O, Rees J, Sims D, Tenesa A, Jackson IJ (December 2018). "Genome-wide study of hair colour in UK Biobank explains most of the SNP heritability". Nature Communications. 9 (1): 5271. doi:10.1038/s41467-018-07691-z. PMC 6288091. PMID 30531825. ^ Mogil JS, Ritchie J, Smith SB, Strasburg K, Kaplan L, Wallace MR, Romberg RR, Bijl H, Sarton EY, Fillingim RB, Dahan A (July 2005). "Melanocortin-1 receptor gene variants affect pain and mu-opioid analgesia in mice and humans". Journal of Medical Genetics. 42 (7): 583–7. doi:10.1136/jmg.2004.027698. PMC 1736101. PMID 15994880. ^ Delaney A, Keighren M, Fleetwood-Walker SM, Jackson IJ (September 2010). "Involvement of the melanocortin-1 receptor in acute pain and pain of inflammatory but not neuropathic origin". PLoS One. 5 (9): e12498. doi:10.1371/journal.pone.0012498. PMC 2938350. PMID 20856883. ^ Liem EB, Lin CM, Suleman MI, Doufas AG, Gregg RG, Veauthier JM, Loyd G, Sessler DI (August 2004). "Anesthetic requirement is increased in redheads". Anesthesiology. 101 (2): 279–83. doi:10.1097/00000542-200408000-00006. PMC 1362956. PMID 15277908. ^ Liem EB, Joiner TV, Tsueda K, Sessler DI (March 2005). "Increased sensitivity to thermal pain and reduced subcutaneous lidocaine efficacy in redheads". Anesthesiology. 102 (3): 509–14. doi:10.1097/00000542-200503000-00006. PMC 1692342. PMID 15731586. ^ Simamura E, Arikawa T, Ikeda T, Shimada H, Shoji H, Masuta H, Nakajima Y, Otani H, Yonekura H, Hatta T (2015). "Melanocortins contribute to sequential differentiation and enucleation of human erythroblasts via melanocortin receptors 1, 2 and 5". PLoS One. 10 (4): e0123232. doi:10.1371/journal.pone.0123232. PMC 4393082. PMID 25860801. ^ Lorenz J, Seebach E, Hackmayer G, Greth C, Bauer RJ, Kleinschmidt K, Bettenworth D, Böhm M, Grifka J, Grässel S (2014). "Melanocortin 1 receptor-signaling deficiency results in an articular cartilage phenotype and accelerates pathogenesis of surgically induced murine osteoarthritis". PLoS One. 9 (9): e105858. doi:10.1371/journal.pone.0105858. PMC 4156302. PMID 25191747. ^ Ji HX, Zou YL, Duan JJ, Jia ZR, Li XJ, Wang Z, Li L, Li YW, Liu GY, Tong MQ, Li XY, Zhang GH, Dai XR, He L, Li ZY, Cao C, Yang Y (2013). "The synthetic melanocortin (CKPV)2 exerts anti-fungal and anti-inflammatory effects against Candida albicans vaginitis via inducing macrophage M2 polarization". PLoS One. 8 (2): e56004. doi:10.1371/journal.pone.0056004. PMC 3573073. PMID 23457491. ^ Seaton ME, Parent BA, Sood RF, Wurfel MM, Muffley LA, O'Keefe GE, Gibran NS (January 2017). "Melanocortin-1 Receptor Polymorphisms and the Risk of Complicated Sepsis After Trauma: A Candidate Gene Association Study". Shock. 47 (1): 79–85. doi:10.1097/SHK.0000000000000708. PMC 5167637. PMID 27488084. ^ Maresca V, Flori E, Picardo M (July 2015). "Skin phototype: a new perspective". Pigment Cell & Melanoma Research. 28 (4): 378–89. doi:10.1111/pcmr.12365. PMID 25786343. ^ a b Feller L, Khammissa RA, Kramer B, Altini M, Lemmer J (February 2016). "Basal cell carcinoma, squamous cell carcinoma and melanoma of the head and face". Head & Face Medicine. 12: 11. doi:10.1186/s13005-016-0106-0. PMC 4744388. PMID 26850723. ^ Binstock M, Hafeez F, Metchnikoff C, Arron ST (October 2014). "Single-nucleotide polymorphisms in pigment genes and nonmelanoma skin cancer predisposition: a systematic review". The British Journal of Dermatology. 171 (4): 713–21. doi:10.1111/bjd.13283. PMID 25319428. ^ Box NF, Duffy DL, Irving RE, Russell A, Chen W, Griffyths LR, Parsons PG, Green AC, Sturm RA (February 2001). "Melanocortin-1 receptor genotype is a risk factor for basal and squamous cell carcinoma". The Journal of Investigative Dermatology. 116 (2): 224–9. doi:10.1046/j.1523-1747.2001.01224.x. PMID 11179997. ^ Lindskog A, Ebefors K, Johansson ME, Stefánsson B, Granqvist A, Arnadottir M, Berg AL, Nyström J, Haraldsson B (2010). "Melanocortin 1 receptor agonists reduce proteinuria". Journal of the American Society of Nephrology : JASN. 21 (8): 1290–8. doi:10.1681/ASN.2009101025. PMC 2938589. PMID 20507942. ^ Lindskog Jonsson A, Granqvist A, Elvin J, Johansson ME, Haraldsson B, Nyström J (2014). "Effects of melanocortin 1 receptor agonists in experimental nephropathies". PLOS ONE. 9 (1): e87816. doi:10.1371/journal.pone.0087816. PMC 3907561. PMID 24498203. ^ Logan DW, Burn SF, Jackson IJ (June 2006). "Regulation of pigmentation in zebrafish melanophores". Pigment Cell Research. 19 (3): 206–13. doi:10.1111/j.1600-0749.2006.00307.x. PMID 16704454. ^ Aoki H, Moro O (September 2002). "Involvement of microphthalmia-associated transcription factor (MITF) in expression of human melanocortin-1 receptor (MC1R)". Life Sciences. 71 (18): 2171–9. doi:10.1016/S0024-3205(02)01996-3. PMID 12204775. ^ Robbins LS, Nadeau JH, Johnson KR, Kelly MA, Roselli-Rehfuss L, Baack E, Mountjoy KG, Cone RD (March 1993). "Pigmentation phenotypes of variant extension locus alleles result from point mutations that alter MSH receptor function". Cell. 72 (6): 827–34. doi:10.1016/0092-8674(93)90572-8. PMID 8458079. ^ Newton JM, Wilkie AL, He L, Jordan SA, Metallinos DL, Holmes NG, Jackson IJ, Barsh GS (January 2000). "Melanocortin 1 receptor variation in the domestic dog". Mammalian Genome. 11 (1): 24–30. doi:10.1007/s003350010005. PMID 10602988. ^ Schmutz SM, Berryere TG (2007). "The genetics of cream coat color in dogs". The Journal of Heredity. 98 (5): 544–8. doi:10.1093/jhered/esm018. PMID 17485734. ^ Eizirik E, Yuhki N, Johnson WE, Menotti-Raymond M, Hannah SS, O'Brien SJ (March 2003). "Molecular genetics and evolution of melanism in the cat family". Current Biology. 13 (5): 448–53. doi:10.1016/S0960-9822(03)00128-3. PMID 12620197. ^ Flanagan N, Healy E, Ray A, Philips S, Todd C, Jackson IJ, Birch-Machin MA, Rees JL (2000). "Pleiotropic effects of the melanocortin 1 receptor (MC1R) gene on human pigmentation". Human Molecular Genetics. 9 (17): 2531–7. doi:10.1093/hmg/9.17.2531. PMID 11030758. ^ Klungland H, Våge DI, Gomez-Raya L, Adalsteinsson S, Lien S (September 1995). "The role of melanocyte-stimulating hormone (MSH) receptor in bovine coat color determination". Mammalian Genome. 6 (9): 636–9. doi:10.1007/BF00352371. PMID 8535072. ^ Takeuchi S, Suzuki H, Yabuuchi M, Takahashi S (August 1996). "A possible involvement of melanocortin 1-receptor in regulating feather color pigmentation in the chicken". Biochimica et Biophysica Acta. 1308 (2): 164–8. doi:10.1016/0167-4781(96)00100-5. PMID 8764834. ^ Theron E, Hawkins K, Bermingham E, Ricklefs RE, Mundy NI (April 2001). "The molecular basis of an avian plumage polymorphism in the wild: a melanocortin-1-receptor point mutation is perfectly associated with the melanic plumage morph of the bananaquit, Coereba flaveola". Current Biology. 11 (8): 550–7. doi:10.1016/S0960-9822(01)00158-0. PMID 11369199. ^ Johnson JA, Ambers AD, Burnham KK (2012). "Genetics of plumage color in the Gyrfalcon (Falco rusticolus): analysis of the melanocortin-1 receptor gene". The Journal of Heredity. 103 (3): 315–21. doi:10.1093/jhered/ess023. PMID 22504110. ^ Ritland K, Newton C, Marshall HD (September 2001). "Inheritance and population structure of the white-phased "Kermode" black bear". Current Biology. 11 (18): 1468–72. doi:10.1016/S0960-9822(01)00448-1. PMID 11566108. ^ Nachman MW, Hoekstra HE, D'Agostino SL (April 2003). "The genetic basis of adaptive melanism in pocket mice". Proceedings of the National Academy of Sciences of the United States of America. 100 (9): 5268–73. doi:10.1073/pnas.0431157100. PMC 154334. PMID 12704245. ^ Fontanesi L, Tazzoli M, Beretti F, Russo V (October 2006). "Mutations in the melanocortin 1 receptor (MC1R) gene are associated with coat colours in the domestic rabbit (Oryctolagus cuniculus)". Animal Genetics. 37 (5): 489–93. doi:10.1111/j.1365-2052.2006.01494.x. PMID 16978179. ^ Peters L, Humble E, Kröcker N, Fuchs B, Forcada J, Hoffman JI (August 2016). "Born blonde: a recessive loss-of-function mutation in the melanocortin 1 receptor is associated with cream coat coloration in Antarctic fur seals". Ecology and Evolution. 6 (16): 5705–17. doi:10.1002/ece3.2290. PMC 4983585. PMID 27547348. ^ Römpler H, Rohland N, Lalueza-Fox C, Willerslev E, Kuznetsova T, Rabeder G, Bertranpetit J, Schöneberg T, Hofreiter M (July 2006). "Nuclear gene indicates coat-color polymorphism in mammoths". Science. 313 (5783): 62. doi:10.1126/science.1128994. PMID 16825562. ^ Jablonski NG, Chaplin G (May 2010). "Colloquium paper: human skin pigmentation as an adaptation to UV radiation". Proceedings of the National Academy of Sciences of the United States of America. 107 Suppl 2 (Supplement_2): 8962–8. doi:10.1073/pnas.0914628107. PMC 3024016. PMID 20445093. ^ Peng S, Lu XM, Luo HR, Xiang-Yu JG, Zhang YP (March 2001). "Melanocortin-1 receptor gene variants in four Chinese ethnic populations". Cell Research. 11 (1): 81–4. doi:10.1038/sj.cr.7290070. PMID 11305330. ^ Harding RM, Healy E, Ray AJ, Ellis NS, Flanagan N, Todd C, Dixon C, Sajantila A, Jackson IJ, Birch-Machin MA, Rees JL (April 2000). "Evidence for variable selective pressures at MC1R". American Journal of Human Genetics. 66 (4): 1351–61. doi:10.1086/302863. PMC 1288200. PMID 10733465. ^ Norton HL, Kittles RA, Parra E, McKeigue P, Mao X, Cheng K, Canfield VA, Bradley DG, McEvoy B, Shriver MD (March 2007). "Genetic evidence for the convergent evolution of light skin in Europeans and East Asians". Molecular Biology and Evolution. 24 (3): 710–22. doi:10.1093/molbev/msl203. PMID 17182896. Roach, Marion (2005). Roots of Desire: The Myth, Meaning and Sexual Power of Red Hair. Bloomsbury USA. pp. 256 pages. ISBN 978-1-58234-344-0. Rees, Jonathan (2003). "The roots of red hair". Wellcome Trust. Archived from the original on 2007-10-30. Retrieved 2007-10-31. Silvers, Willys K. (1979). The Coat Colors of Mice. Springer-Verlag. ISBN 978-0-387-90367-5. Silvers, Willys K. (2003). "The Coat Colors of Mice". Mouse Genome Informatics. "Melanocortin Receptors: MC1". IUPHAR Database of Receptors and Ion Channels. International Union of Basic and Clinical Pharmacology. This page was last edited on 2 March 2019, at 10:12 (UTC).